Today didn’t feel like anything special when I woke up. It was just another morning. But, it was also the dawn of my thirty-fourth birthday. I awoke before sunrise, as I seem to be wired to do lately, and started getting dressed. I’ve noticed that I get melancholy if I lounge around the house, so I headed out the door this morning a little after 7 AM to get my day jump-started. 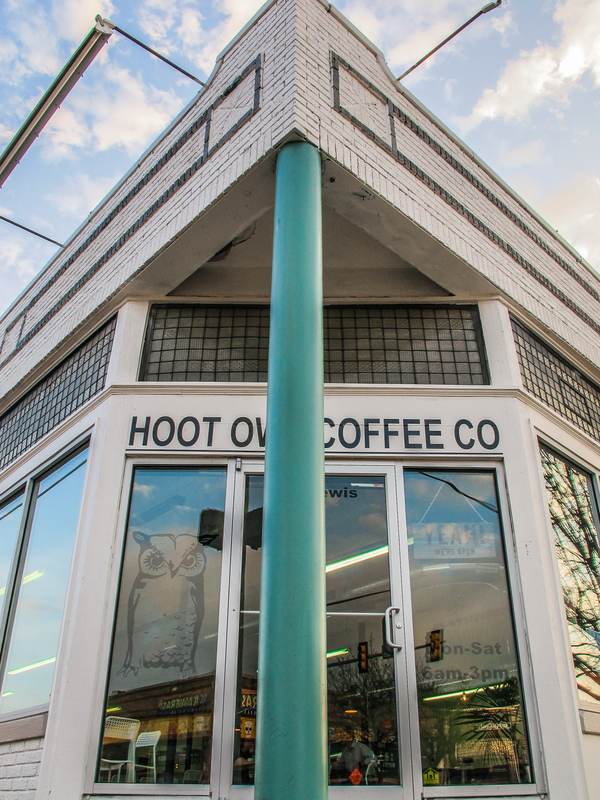 I headed to one of my favorite new spots in Tulsa, Hoot Owl Coffee. It’s a little shop on an old alignment of Route 66 at Lewis Ave, just a few doors down from the Circle Cinema. The coffee they serve is fantastic and the owner is a super nice guy. When I went in for the first time a few weeks ago, I talked to him about the shop and his history. Turns out this wasn’t his first shop on the Mother Road; in fact, his first coffee shop was in a little town called Vega, Texas. I know Vega; I drove through there on my way to Albuquerque last year. Every time I’ve been in Hoot Owl since, Andrew and the rest of his staff have been extremely kind and generous with their time. And, as I mentioned, the coffee is fantastic. They are very focused on their craft and dedicated to a business model that gives back. They buy fair trade coffee and donate to local food banks with a dedicated slice of their profit. They also offer a variety of brew methods, which has made me a little more adventurous with my choice. If you like coffee, you gotta check ’em out. Once I had my coffee (pour-over of an Ethiopian blend) and conversation, I headed back to the car and thought about what I wanted to do with my day. I hadn’t really thought through what I wanted my birthday to be this year. Time just flies…I hadn’t given it much thought. My mind settled on Route 66, as it often does. I realized that I had not driven the stretch between Claremore and Miami, OK eastbound. That seemed like a great idea, and I put the car in drive…but something didn’t feel right. I wasn’t quite ready to go. In actuality, I didn’t want to sacrifice a tentative lunch plan I already had. One of my all-time favorite local restaurants is Burn Co. BBQ, and they’re closed on my normal days off. Today would be the first time in a long time I’d be able to savor their delicious food. So I delayed my trip; I drove over to the Golden Driller and took some shots as the dawning sun broke through the clouds and awaited my reward of ribs and pulled pork. It may not sound like a big deal, but when I am itching to get on the road, a few hours is like torture. Well, it was worth it. I met up with my buddy Noah and enjoyed a succulent meal of savory meats. Burn Co cooks everything on Hasty Bake grills and the flavor that results from their method defies description. But, again, it wasn’t just about the quality of my meal…it was also about the company I was in and the conversation I was having. Noah and I talked about all manner of music and local happenings while the restaurant buzzed with similarity. By the time we shook hands and parted ways, the line of people waiting to order extended out the door and down the sidewalk, as usual. Now it was time to vamoose. The air was warm and the sky was welcoming as I drove down the highway, heading northeast along Route 66. It’s amazing what a change in perspective can do; although I’d driven that stretch of road several times, seeing it from the opposite direction opened my eyes to a few new sights as well as some old ones that suddenly became more interesting. Furthermore, since I was now armed with a travel guide written by noted Route 66 expert Jerry McClanahan, I had more knowledge about the places I saw. Spending time on the road is like spending time with a cherished family member you don’t see every day; there’s a sense of familiarity, but also the understanding that it could surprise you at any time. Such a surprise occurred as I drove through the town of Afton. Not only was their star attraction, a restored D-X service station called Afton Station, open for visitors but a familiar car sat outside: a beautiful 1956 Chevrolet owned by my friend Ron Jones. Ron is known as the ‘Tattoo Man’ of the Route due to his 138 Route 66-themed tattoos. I met him when I went to the Gasconade Bridge Rally and the memorial for Gary Turner in March. We’d had lunch the previous day but I somehow missed the fact that he was going to be in Afton. I walked into Afton Station and shook hands with Ron, who was there to meet up with a group touring the entire Route that had flown over from the Netherlands. 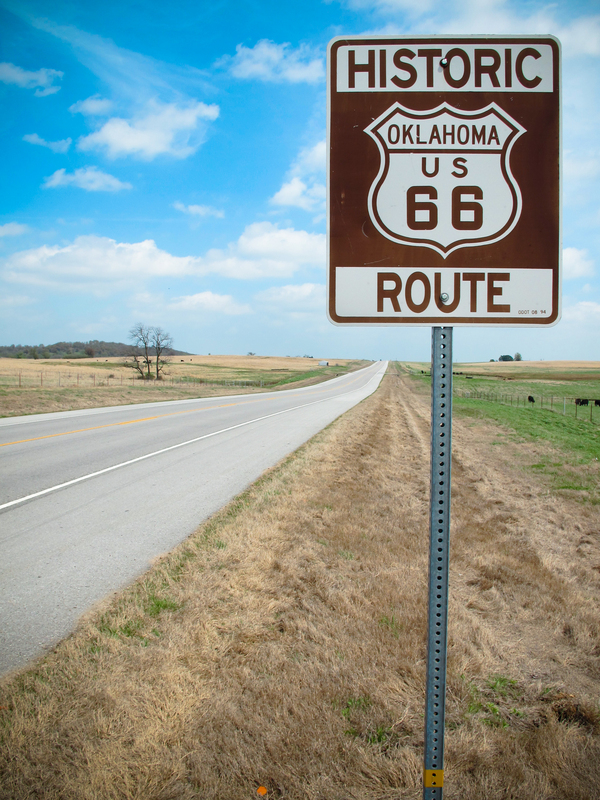 Route 66 is very popular with people from other countries, and why wouldn’t it be? 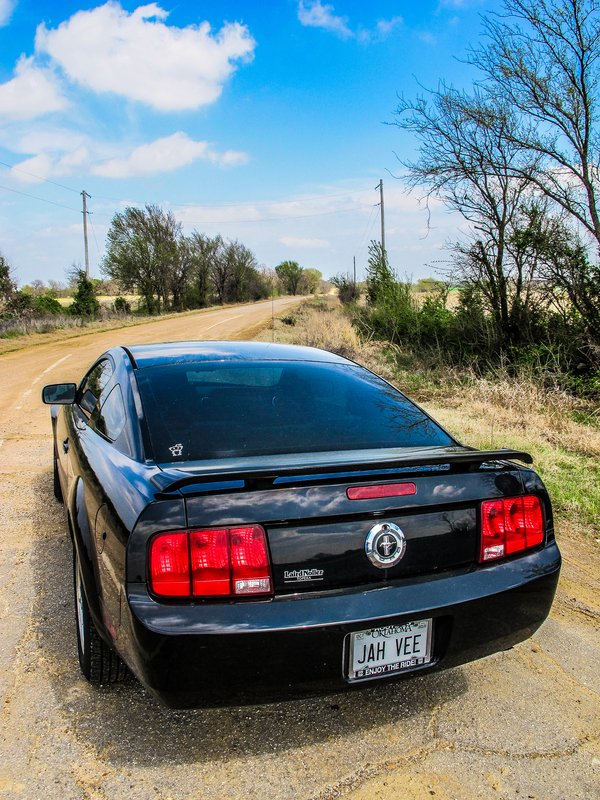 The road encapsulates the American experience in a way that few other things can. I also had the pleasure of meeting the proprietor of the Station, a lovely woman named Laurel. 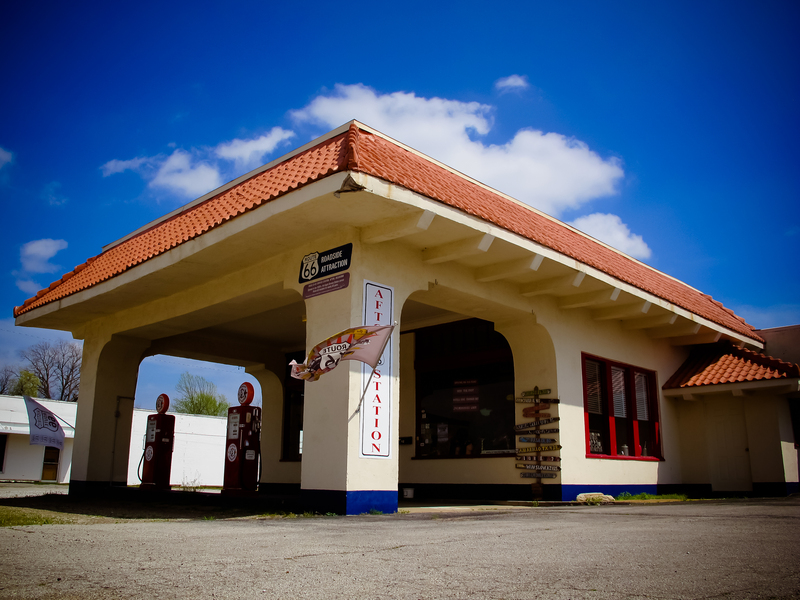 Not only did she run a little gift shop, but the station also held a Packard automobile museum! I met some of the other Station folks and toured the facility. There are a lot of great old cars there, including a classic Studebaker and a few other non-Packard classics. 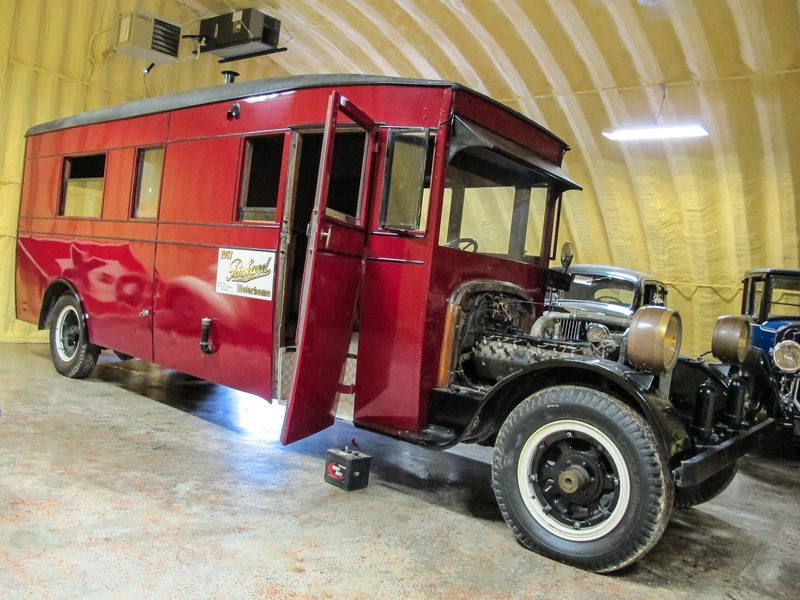 My favorite vehicle was a behemoth way in the back: an old Packard RV from 1917! It had a little burner stove, space for an ice box, and a fold-out bed. 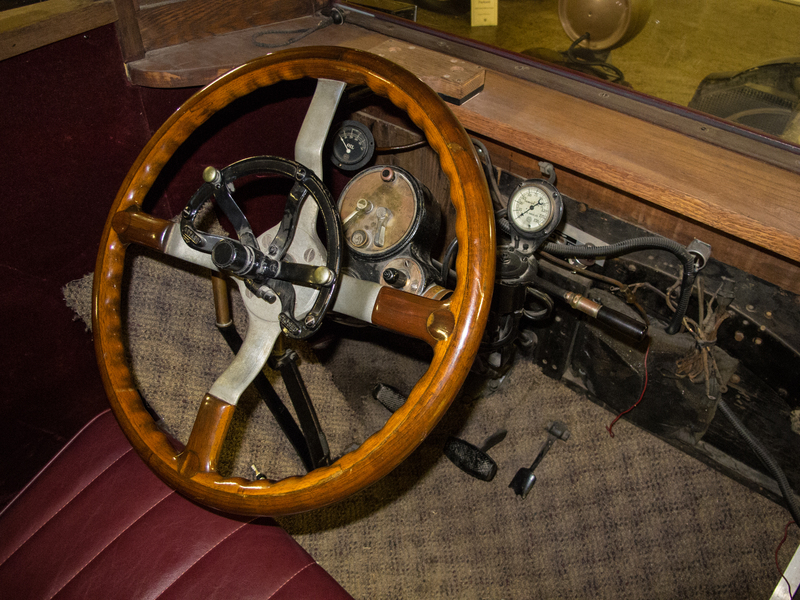 The steering wheel was wooden and the instrument cluster was extremely sparse. There were a few levers near the driver’s seat, too, but heck if I know what it was all used for. A SUPER COOL vehicle! Once I was satisfied with the car museum, I returned to the front and talked to the crew for probably an hour. We talked about their regular visitors, the folks that come from overseas, the things that have changed, and the things that haven’t. That’s the thing I’ve learned about Route 66; it’s not just the insight into yesteryear and the roadside photo ops. It’s the people that are on the road TODAY. So many people with so many stories; their passion shines through in a way that makes you want to learn more. I didn’t get the opportunity to share in any of Gary Turner’s stories before he passed away…and I don’t plan on making that same mistake again. As I left, I thanked Laurel for the lovely visit. She asked me to come again real soon…and I will. I’m so pleased to be introduced to your blog, which I intend to read regularly. We are apparently cut from the same cloth. I love to rise early and photograph things at dawn, and of course my favorite things are right on Route 66! You can catch some of my sunrise photos (not as good as yours!) at http://www.aftonstationblog-laurel.blogspot.com. Lets visit again soon.